Revolutionary surface gauge for the shop floor. Increases yield 20-40% in machine shops and rework centers. By measuring a part's nominal defect features right up to the line of the specification, customers find that they are able to pass more parts, and rework many parts that a fingernail test, comparator, or pocket stylus would have failed. 20%-40% improvements in yield are typical reported figures from 4D InSpec purchasers. "It paid for itself in the first week." 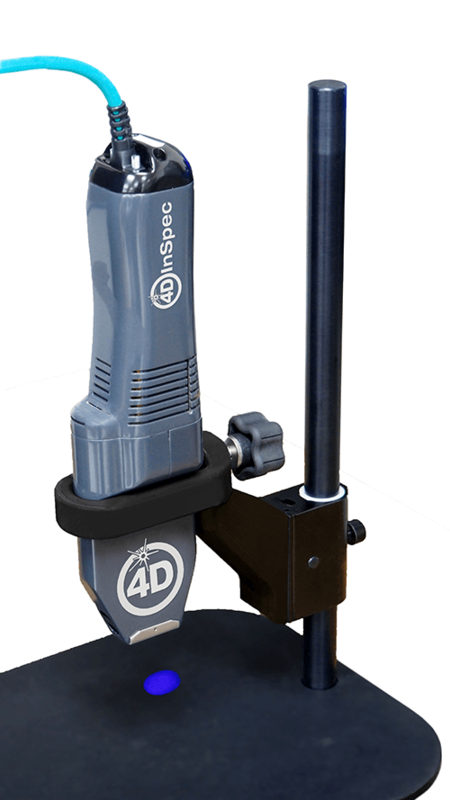 The 4D InSpec Surface Gauge is the first handheld, precision instrument for non-contact surface defect measurement. With micrometer-level resolution, portability, affordability and ease-of-use, 4D InSpec puts high resolution measurement where it's needed: on the factory floor, in machine shops and in field service applications. 4D InSpec instantly quantifies defects such as pits, scratches, nicks, dents and bumps, and measures features such as edge break, radii, rivet depth and dot peen depth, from 0.1 to 100 mils deep. 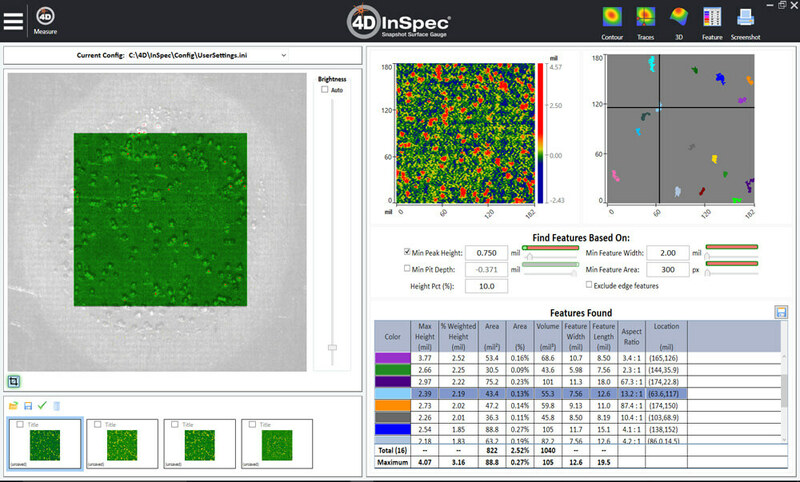 4D InSpec is far more repeatable and accurate than visual comparison techniques typically used for surface defect measurements. And unlike high-end metrology systems it is rugged, flexible and affordable, to measure a wide range of part geometries in the most challenging environments. 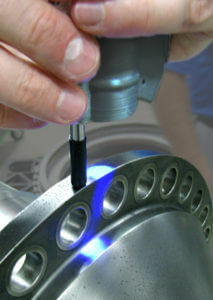 The 4D InSpec can be handheld to access tight corners or to sample large surfaces directly on components. An optional fold mirror accessory lets the system function like a borescope to access features without line of sight. One-button operation and immunity to sensor movement make it easy to align and measure, while a rugged design and single cable tether withstand the rigors of daily use. In a workstation configuration 4D InSpec makes it fast and easy to obtain repeatable quality control data. An intuitive, touchscreen interface handles setup, operation, analysis and report generation. The 4D InSpec can also be mounted on a robotic manipulator for fully automated measurements of complex components. The included software with intuitive touch-screen interface automatically locates defects and calculates their height, volume, area, slopes and location. The operator can choose from 2D traces or 3D plots to view defects in great detail. The system also supports easy data transfer to quality control systems via LAN, USB or WiFi for rapid pass-fail analysis. A complete 4D InSpec system includes the instrument, computer with HD 1080p touch-screen interface, single Ethernet cable tether, software and benchtop stand (shown below). A series of accessories, including a portable workstation and Li-ion rechargeable battery with up to 8 hours operational time, are also available to improve portability and productivity. 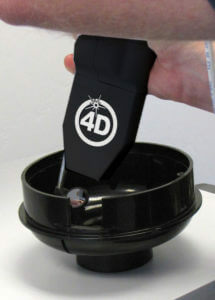 May we occasionally contact you with information regarding 4D Technology products and services? We are committed to keeping your data private and will no longer send you information if you request it at any time.